Other information: Good with cats, dogs and kids. You can meet Magic at Excalipurr Cat Café (2156 Albert Street, Regina). Found stray and hungry, Magic and his siblings were rescued from the streets in the early days of summer. They were placed into a foster home where he and the other kittens thrived. Now, Magic seems to cast a spell on everyone he meets! Or, perhaps, it’s his outgoing and playful personality that has made him a favourite at Excalipurr. Dog, cat, or human, no one can resist him, while he likewise wastes no time in letting you know you are his friend. Magic is equally suitable for a first pet, or as an addition to a large family. Should you welcome Magic into your home, his charm will be sure to entrance you too! 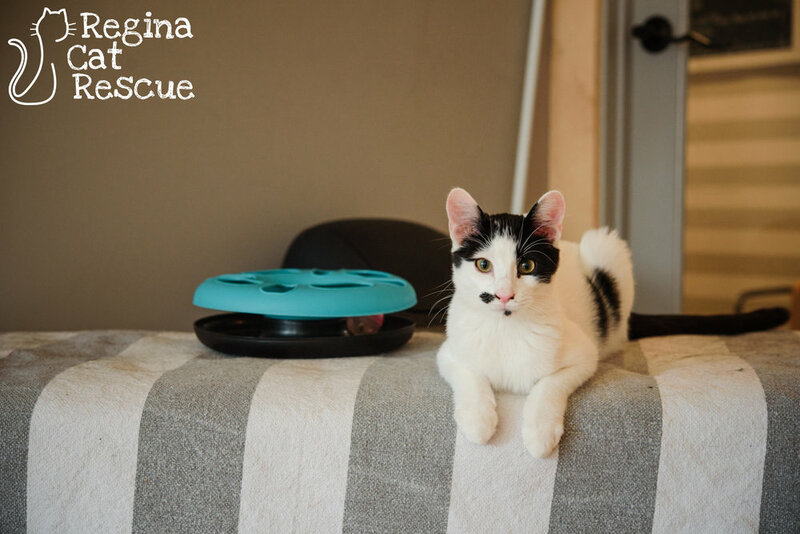 If you are interested in Magic, click here to view our adoption contract and click here to complete an adoption application or email the RCR Adoption Coordinator at adoptions@reginacatrescue.com for more info.